Whilst not quite matching January's mega-deal tally February brought home a very respectable score of three deals with values in excess of $1bn. Within the top 20 deals by value for the month the prevailing mood was buy, buy, buy, be it wholesale acquisition of companies (six during the month), business units (two) or single assets (two). …as many a broken heart and now it would seem a pharma executive can testify. The two top-value February deals involved Pfizer and Valeant, both companies subject to rejection and “unrequited love” in 2014. In its first major acquisition since the AstraZeneca debacle, Pfizer disclosed its intention to acquire the biosimilar and injectable drug specialist Hospira, nine days after also reporting disappointing fourth-quarter results. The price, $17bn, representing $90 a share in cash, a 39% premium. The prize, an immediate revenue boost from the generics injectables business as well as a portfolio of late-stage biosimilars, some already marketed in the EU including versions of Retacrit (epoetin zeta) and Nivestim (filgrastim), and the Remicade copycat Inflectra (infliximab), the first monoclonal antibody to be approved. There are no approved biosimilars in the US where Hospira awaits approval of Remicade and Retacrit. Assets that Hospira acquired with Celltrion are essentially replicas of existing Pfizer programmes eg Herceptin and Rituxan and these will probably be divested. Clearly Pfizer means to take its share of the biosimilars market which is expected to account for ~$25bn in sales by the end of the decade. Hospira's broad generic sterile injectables business covers acute care and oncology which compliments Pfizer's branded sterile injectables covering anti-infectives, anti-inflammatories and cytotoxics. This will create a leading global sterile injectables business in an area considered to be a relatively 'safe' development risk. What better way to spend that pocket burning $33bn cash reserve to rescue those falling sales figures. No doubt Pfizer had hoped Hospira's persistent manufacturing problems were a thing of the past. The sedative and analgesic propofol recall on the very day the acquisition was announced due, and not for the first time, to particulate iron embedded in the neck of a vial must have come as unwelcome news. Canada's serial acquirer Valeant (60 acquisitions in six years) soon overcame any tears shed over the failure to pull in Allergan by announcing two acquisitions in February. Valeant had to beat Shire to claim the GI specialist Salix Pharmaceuticals paying $14.5bn ($158.00 per share in cash). This represents a sales multiple of 13 on Salix's 2014 sales of $1.14m (24% growth on 2013) which may be considered high given that Salix made a loss in 2014 of $0.4bn. On the other hand, Salix boasts a 22 product portfolio including the prescription brands Uceris (ulcerative colitis), Relistor (constipation), and Apriso (ulcerative colitis) and a strong near-term pipeline, however the real interest driver is Xifaxan. Xifaxan is currently marketed for the treatment of hepatic encephalopathy and traveller's diarrhoea and nets $750m in sales, however, should the current FDA review for an inflammatory bowel disease with diarrhoea (IBS-D) label be successful, this figure could rise to $2bn. 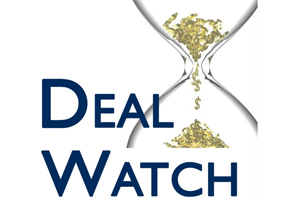 This month saw the deadline, highlighted in January's Deal Watch, for Valeant to acquire Dendreon, and more specifically the dendritic cell, prostate cancer vaccine Provenge (sipuleucel-T), come and go. Valeant emerged victorious however only after increasing the original bid of $296m to $400m as other interested parties arrived at the table. This is a brave move for the oncology and cell-therapy naïve company. Challenges associated with turning this asset around e.g. complex production, sky-high price tag, looming competition from oral rivals Xtandi (Astellas) and Medivation) and Zytiga (J&J) will be daunting. The 'not recommended' announcement from NICE just days after the acquisition deadline passed exemplifies the mountain to be climbed. NICE has concluded that the price is “too high for the benefit it may provide to patients” and there is no conclusive evidence that sipuleucel-T works better than other treatments currently available nor that it delays the progression of the disease, unlike current treatments. Valeant aspires to become a top 5 pharma company by the end of 2016. This by definition dictates a move away from its core skin and eye care focus, however is this a step too far? The lure of the predicted ~$35bn immuno-oncology market continues unabated. February saw BMS further signal its intention to lead in this space announcing two simultaneous deals, the acquisition of Flexus Biosciences and a collaboration with Rigel. The primary draw for the Flexus acquisition, commanding a $800m upfront payment and a potential $450m in development milestones is the Indoleamine-2, 3-dioxygenase/Tryptophan-2,3- dioxygenase (IDO/TDO) discovery programme, which includes IDO-selective, IDO/TDO dual and TDO-selective compound libraries and more specifically the lead preclinical small molecule IDO1-inhibitor F001287 planned for IND filing later in the year. IDO and TDO are enzymes expressed by many tumour and tumour-surrounding cells. They produce kynurenine which in turn suppresses T-cell function and thereby inhibits the immune system. IDO/TDO inhibitors reduce kynurenine production enabling the immune system to attack tumours more effectively. As well as the already marketed Yervoy (ipilimumab) and recently FDA approved Opdivo (nivolumab), BMS has four additional immuno-oncology drugs in clinical trial. None are small molecules and none have this mechanism, leaving them plenty of opportunity to explore differing single and combination therapy approaches across various tumour types targeting different and complementary pathways e.g. checkpoint inhibition. Upon completion the Flexus team will spin-out the non-IDO/TDO assets of Flexus and start a new company based at the current facilities. The earlier stage collaborative deal with Rigel is to develop and commercialise small molecule inhibitors of TGF beta receptor kinase. Like IDO/TDO enzymes, TGF beta is expressed from the tumour and nearby cells and/or infiltrating macrophages into the tumour microenvironment where it promotes differentiation of specific suppressive T-cells and hence tumour growth. Drugs that inhibit this mechanism would give BMS yet further ammunition to fight the ability of cancers to escape the body's immuno-surveillance defence sytems. In return for exclusive, worldwide rights to develop and commercialise any drugs that come from the collaboration, Rigel will receive $30m upfront with developmental and regulatory milestones that could add up to more than $309m. … of GPCRs, a bedrock for drug discovery over several decades yielding ~40% of currently marketed drugs, and covering a range of therapeutic areas, has been demonstrated by Heptares since its founding in 2007. Heptares has fine-tuned the approach designing improved, stabilised drugs building on an in-depth understanding of the structure of receptors, and structure-based drug design employing the proprietary StaR technology platform. This has been rewarded over the years by a string of research alliances with companies including AstraZeneca, MedImmune, Novartis, Takeda and Cubist (now Merck & Co), as well as an extensive in-house clinical and preclinical pipeline targeting serious diseases with blockbuster potential eg Alzheimer's disease, ADHD, metabolic disease, schizophrenia, migraine. It came as no surprise therefore to learn of Sosei's acquisition of this UK biotech jewel with an upfront payment of $180m in cash and up to $220m in milestones. Heptares will become a wholly owned autonomous subsidiary, with its existing R&D operations continuing in the UK. Mylan has been very busy in recent weeks. As well as completing the acquisition of Abbott's non-US Specialty and Branded Generics business first announced last summer and signing an exclusive agreement with Gilead Sciences to distribute Sovaldi and Harvoni in India, time has been found to ink the acquisition of certain female reproductive healthcare business units from Mumbai-based Famy Care and a chronic obstructive pulmonary disease (COPD) drug-development pact with Theravance. The deal with Famy Care involves an upfront cash payment of $750m plus contingent payments of up to $50m and builds on existing partnerships between the two companies in North America, EU and Australia. In addition it complements the Abbott deal which also includes a women's health care portfolio. Together these deals make Mylan a hormonal contraceptives leader in high-growth emerging markets. The co-development and marketing deal with Theravance involves TD-4208 a novel, phase 3 ready, once-daily, nebulised, long-acting muscarinic antagonist (LAMA) under development to treat COPD and other respiratory diseases. Theravance will receive $15m in cash, $30m in equity investment ($18.92 per share, 10% premium) and is also eligible to receive up to $220m in milestones plus sales royalties. As well as leveraging Mylan's expertise in manufacturing and marketing complex respiratory products, Theravance also interestingly retains the right to co-promote in the US and global rights to metered dose inhaler or dry powder inhaler versions of the drug. In ex-US markets (apart from China), Mylan will be responsible for the development as well as commercialisation of the product and Theravance will receive royalties on net sales. Mylan acquires an asset that complements its existing respiratory portfolio which includes Perforomist Inhalation Solution, the already marketed nebulised COPD product. It was announced in February that Vernalis has licensed its proprietary adenosine receptor antagonist programme, including the phase 1/2 lead compound V81444, for use in all therapeutic applications. Its initial development was focused on ADHD and other neurological diseases. The deal terms include a $1m upfront payment, milestone payments over $200m, single digit royalties on market entry and possible double digit royalties. Unusually however the partner company is not identified except to say it is a well-funded private US company with “a wealth of clinical and commercial expertise and experience” - a mystery!